Notre Dame Law School prides itself on educating a different kind of lawyer, and 2L Ron Ruangtragool took a different path to law school. 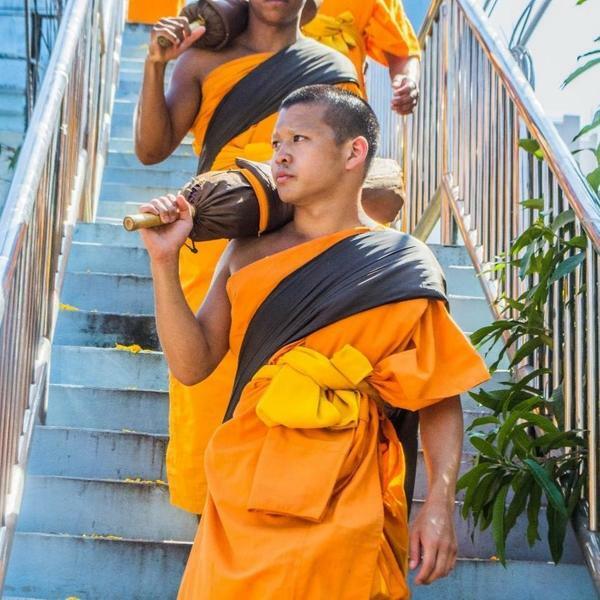 After earning a bachelor’s degree in political science and international development studies at the University of California, Los Angeles, Ruangtragool went to Thailand to be a Buddhist monk. He spent two years in Thailand, including seven months as a monk, working with the Dhammakaya Foundation. He counseled children and novice monks and helped organizations access resources to build roads, clinics, and meditation halls in underprivileged communities. “It’s a Thai tradition for sons to go back and self-develop, to self-realize the flaws that we have, and to gain a greater sense of self-awareness,” said Ruangtragool, whose parents immigrated from Thailand to southern California in the 1970s. The experience in Thailand demonstrated how legal knowledge can change people’s lives and communities, Ruangtragool said, and it confirmed his plan to pursue a law degree. The experience also helped Ruangtragool earn a scholarship from a California law firm. He received the 2016 Future Lawyer Scholarship from The Reeves Law Group, a personal-injury firm based in the Los Angeles area. He beat out dozens of other applicants for the $3,000 scholarship, which is awarded to a law student who demonstrates a genuine desire to use the legal system to fix problems and improve conditions in society. Christine Venter, director of the Legal Writing Program at Notre Dame Law School, said she was delighted that the Reeves Law Group recognized Ruangtragool’s desire to use his law degree to do good in the world. Ruangtragool grew up working in Thai restaurants that his parents own in Orange County, Calif., and he has incorporated entrepreneurship studies into his legal education. Ruangtragool was a summer associate last year at DLA Piper in Bangkok, where his responsibilities included drafting legal memorandums about international arbitration, securities fraud, and corporate compliance, and assisting attorneys with legal research in mergers and acquisitions, commercial negotiations, and real estate cases. He plans to spend this summer working with the Rotary Club of Thai Town in Los Angeles. He will be president of the Phi Alpha Delta legal fraternity at Notre Dame Law School during the 2017-18 academic year. Originally published by Kevin Allen at law.nd.edu on May 15, 2017.